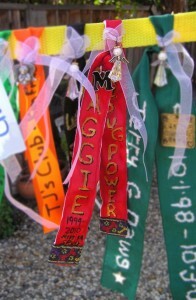 Have you honored your three-legged dog or cat by adding a special ribbon to the Tripawds Tribute Leash? 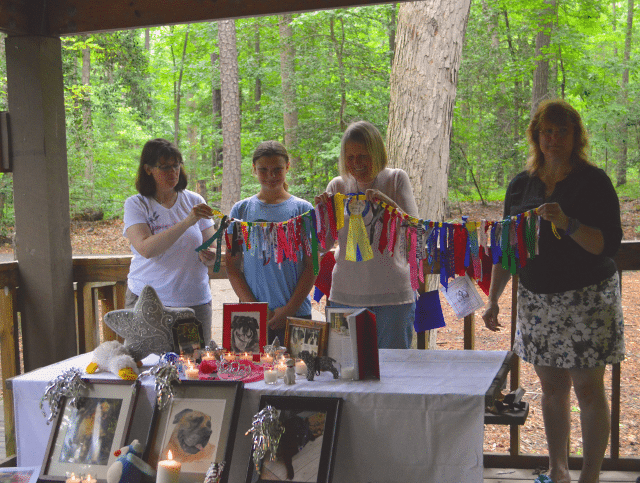 The Tripawds Tribute Leash project began in 2012 when long-time member Karen Riley had an idea to honor our three-legged heroes with a traveling display that could travel from town to town, kind of like Barney. “In 2010 and again in 2011 Chloe’s Mom Nicole went to the Morris Animal Foundation K9 Cancer Walk wearing a tee-shirt she made that honored Tripawds and Angel Tripawds who dealt with cancer. 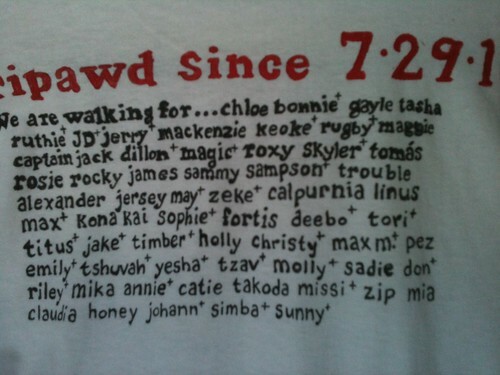 She wrote the names of Tripawds on the back of her shirt so they could travel with her in spirit as she did the walk. It was such a touching idea; it got me thinking about a more permanent way to honor our cancer fighting Tripawds. I brought up the general idea with Rene about some sort of traveling tribute that members could take to these kinds of events, a perpetual thing that we could share. At first we thought the Tribute would honor the Angel and Spirit Tripawds who were lost to cancer. As we talked more it made sense to include Tripawds battling cancer that were still on the journey. But to make something that truly represented the site and the intertwined stories that make the community so strong we decided that all furry family members would be included, tri or quad-pawds, cancer or not. The Tribute came to be before we had any kitty members so it is still a bit dog centric, we are still waiting for our first kitty ribbon (hint hint). After lots of discussions and input from several members the Tripawd Tribute Leash was born in March of 2012. The Leash is yellow because the original Tripawds bandannas were yellow, and it represents the strength of our community. 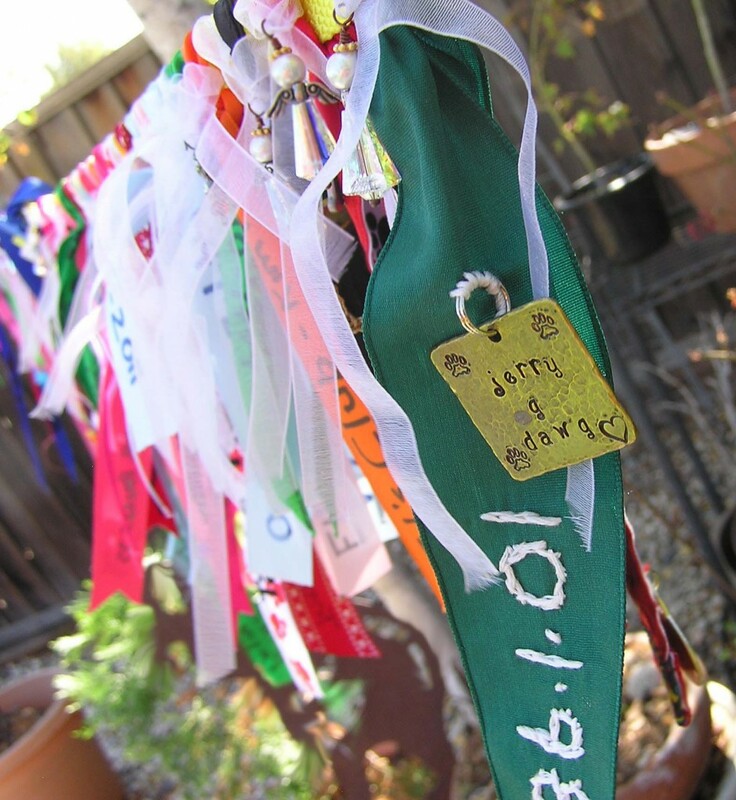 Ribbons of all colors are tied on the leash and not only represent our pups or kitties, but also how we are all tied to this community. Some ribbons are simple, some are more elaborate but each represents a cherished companion who is forever part of our family. Please read the original Blog Post or this Forum Topic for instructions if you would like to participate. The Leash has traveled to several events around the country in the last couple of years, if you have an event coming up and would like to display the Leash please visit the Tripawd Parties Discussion Forum. Good….so glad this is staying in the forefront! And yes, it’s an all inclusive way to honor all! So much history to learn o n this site! Belated hugs and thanks to Chloe’s mom for kicking things off with the tee.shirt! Karen and Pug Maggie have created cathartic magic with this Tribute Leash that celebrates and honors our furbabies in such a personal and heartfelt way. I REALLY hope everyone takes time to consider a Tribute Ribbon for their cat or dog. As was shared…it’s for everyone! Karen has made it incredibly easy to do! Join in on this beautiful celebration of life and love!